The head of China’s top court, Zhou Qiang, met with Mogoeng Mogoeng, chief justice of South Africa, on April 2 in Beijing, signing a memorandum of understanding on cooperation. 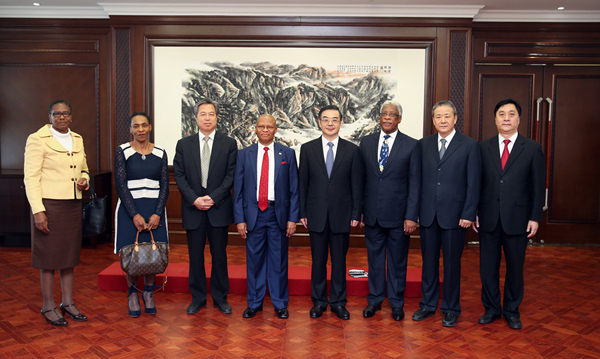 Zhou, chief justice and president of the Supreme People's Court (SPC), welcomed his South African counterpart and briefed his guest about the rule of law and judicial reform in China. He said China pays great attention to the rule of law, adding that the informatization of courts, the quality and efficiency of trials, and judicial credibility all keep improving. Zhou said that the two countries have maintained sound cooperative judicial relations since the establishment of diplomatic ties. China is willing to deepen cooperation with South Africa in informatization of courts, judge training and case study, among other fields, added Zhou. Mogoeng echoed Zhou, talking about the court system and judicial progress in South Africa. He spoke highly of China’s achievements in the law sector, especially in informationization of courts and judicial reform. He said South Africa is willing to have more pragmatic cooperation with China and enhance bilateral exchanges and communication.